Big Art Group's 11th group work, SOS, is on the cover and inside this month's Yale Theater Journal with an introductory article on the production by Jacob Gallagher-Ross. "Presented at New York’s the Kitchen in March 2009, as the aftermath of the credit cataclysm continued to convulse the nation, Big Art Group’s SOS stages the theatrical equivalent of the financial crisis, a conflagration of the society of spectacles. The housing bubble, the company suggests, was a symptom of a more dangerous, and ongoing, process of inflation. SOS depicts an unmoored culture in which signs can only be exchanged for other signs, every radical gesture is already a marketing strategy, and “realness” is a value that arrives prepackaged for sale. Big Art Group suggests that, in addition to its gapped balance sheets, today’s America also has a reality deficit, an addiction to ever-increasing levels of abstraction. 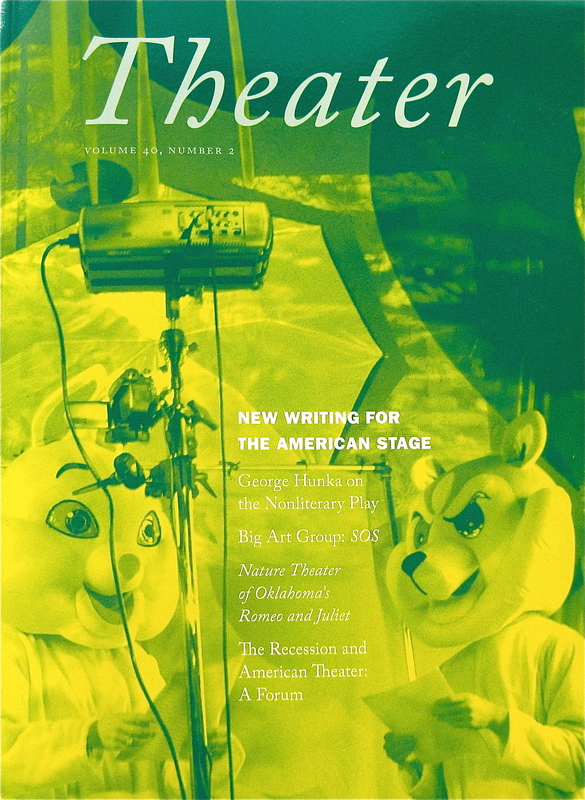 SOS revs America’s culture of headlong consumption to fever pitch, suggesting that renewal is possible only through destruction"
For more than thirty years Theater has been the most informative, serious, and imaginative American journal available to readers interested in contemporary theater. It has been the first publisher of pathbreaking plays from writers as diverse as Rinde Eckert, Richard Foreman, David Greenspan, W. David Hancock, Peter Handke, Sarah Kane, and Adrienne Kennedy. Theater has also featured lively polemics and essays by dramatists including Dario Fo, Heiner Müller, Suzan-Lori Parks, and Mac Wellman. Special issues have covered theater and ecology, new music-theater, South African theater, theater and social change, new Polish directing, and theater and the apocalypse.